These days, I am hearing a lot more people talk about comedy and comedians. As satellite radio and (to an extent) Internet radio seem to becoming more popular, more and more people seem to be finding a happy listening home on the all-comedy stations. For instance, a co-worker of mine talks all the time about some comic or another he heard on Sirius' satellite comedy channel. Anyway, the upshot is that this new technology seems to be opening up more doors for comics. I say seems, because I have no hard and fast numbers on this. I am just calling it as I see it. I will keep using generalizations and saying "seems" so that Brendan does not get sued. I am not holding a bake sale for the Evil Sponge Defense Fund! 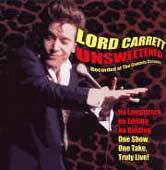 On his website, comedian Lord Carrett (not pronounced like the vegetable) confirms that his career is being helped by the advent of satellite radio, where you can sometimes hear cuts from his comedy album, Lord Carrett: UNSWEETENED. As a side note, Lord Carrett is a fan of Rockabilly, and I have to say it is a shame that his pompadour does not come through on the CD. When you listen to the CD, you are listening to one entire Lord Carrett performance, uncut and unedited. In the liner notes, Carrett says that he wanted to present one whole unaltered performance because, "It just seems more honest this way. The truth is, the guys whose CDs are a Frankenstein’s Monster of sewn together bits will never come close to having as good a set live. I might do better!" I am not sure how many comedians record comedy albums this way. Again, I have no data to back this up, but I am willing to bet that he is not the first. But the format is a risk, and I have to admire that. The risk pays off in some ways and doesn't in others. As a performer, Carrett seems to throw a bunch of jokes at the wall and see what sticks. Some of it is very funny. Some of it is not. His bits are hit or miss. There are some points in the act where my mind would wander only to be brought back by something that made me laugh and laugh big. While there are some sections that drag, Carrett has a very unique comic voice. What I can say is that even the draggy parts are original. Carrett is very unique in his timing, topics, and outlook on life. I am trying to think of a comedian I can compare him to, but I keep coming up short. There are things that everyone can relate to, such as the cycle of bereavement when a car dies. But there are also things that just come out of nowhere, such as a pondering about why do you never see a zombie sitting down. The unedited format really showcases one of Carrett's talents: handling the audience. Some of the comments that he makes when jokes do not go over well are funnier than the jokes themselves. Carrett has made an art of taking what could be an awkward moment with a heckler or a joke that fell flat, making it even more awkward, then making it funny. I found myself laughing at failed-joke comebacks such as, "It is so nice to be in town for the quick-to-judge festival." I would not recommend the CD to everyone. But if you hear some of Carrett's bits on satellite or Internet radio and like him, buy the CD. It is a fun, but odd, ride.